1950's or 60's USALite 3 color signal flashlight, with the box. This flashlight could be consider on the rare side, but not the big money flashlight. These can be hard to find with the box. This is only the third one I have seen, (and the first box) the other two, not in the best of shape. This one is near mint and works like it should. Sometimes, it pays to wait. The white light is considered the utility light, the red light is a warning light, and the green is for a safety signal light. Also has an adjustable focusing head. Uses 2 D cell batteries, and came with a ring hanger. You'll also see a nice 3 cell flashlight made for the Navy, (has USN printed on the body) and the MX-212/U and TL-122/C military right angle flashlights. The MX and TL are the plastic models which came after the all metal ones. 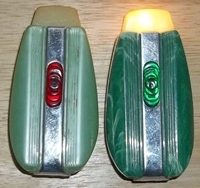 If you're a USALite collector, you might see a couple of pocket/purse spot-lights, you never seen before. Color wise anyways. Located on the right side near the bottom. Here's another USALite flashlight I have never seen before. Really nothing special, but, it has something not found on other USAlite, D cell flashlights. View below. USALite 3 cell flashlight with a belt clip. NOTE: The Red-Head Jr. also has a belt clip, but that one uses 2 C cell batteries. We have all seen a belt clip other flashlights using 2 cell batteries, not many 3 cells flashlights. The flashlight is not in the best condition, but it does work. This time, the condition is not important, the find is. 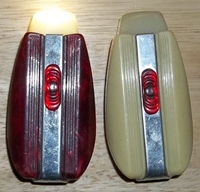 1940's USALite pocket/purse spotlights in different colors. The white and the brown spotlights are two you may have never seen before, and hard to find! More info coming soon, which will be in the Show & Tell section. The brown light is different from all the others, maybe even the year.